BUHS Reads "Shipwreck at the Bottom of the World"
Here you will find links to our library catalog, online databases, and other resources. Please see a librarian for database passwords, to locate books and other materials, or to answer any questions. We are here to help! Library Hours: Monday-Thursday 8:4:30, Friday 8-3:30. Green Mountain Book Award Winner! 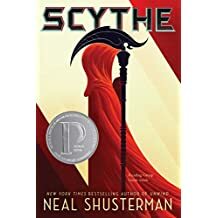 Students in Vermont chose Scythe, by Neal Shusterman as the best book of 2018. Check out a copy today! Keep voices low and bodies separate.